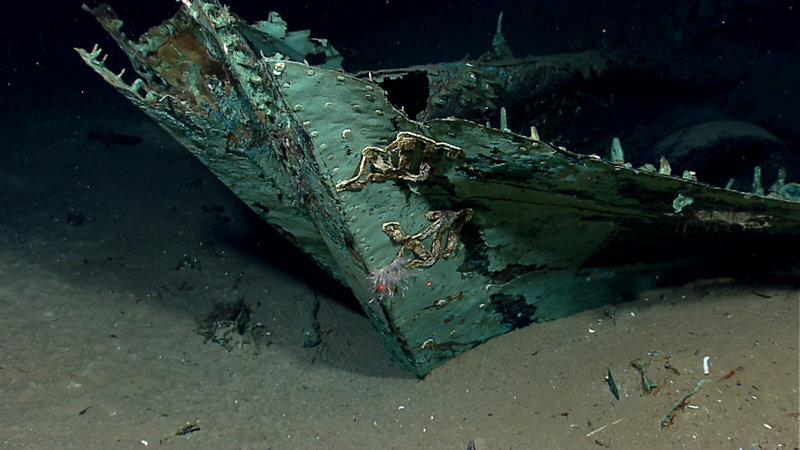 Between July 18 and 25, the Ocean Exploration Trust's Exploration Vessel (E/V) Nautilus returned to investigate an early 19th century wooden shipwreck first explored by the NOAA Ship Okeanos Explorer in April 2012. Learn more about the events leading up to the current expedition below and be sure to tune in for live video from the E/V Nautilus . Copper sheathing covers the vessel's stern post and aft part of the lower hull. The rudder attached to the stern post has been twisted around to the left, or port, side, making it difficult to see in this image. This type of damage suggests the vessel impacted the seafloor stern-first, displacing the rudder. Two draft marks made of lead are visible on the stern post. Image courtesy of the NOAA Office of Ocean Exploration and Research. Download larger version (jpg, 1.3 MB). As with many of Okeanos Explorer’s most important discoveries, the work on a shipwreck discovered last April dubbed “the Monterrey Wreck” (BOEM Site 15577), which lies offshore in an area adjacent to Flower Garden Banks National Marine Sanctuary, has catalyzed follow-on research activities. In a partnership between the Meadows Center for Water and the Environment at Texas State University and the Ocean Exploration Trust (OET), an expedition will return to Site 15577 on the E/V Nautilus from July 18 to 25, 2013. 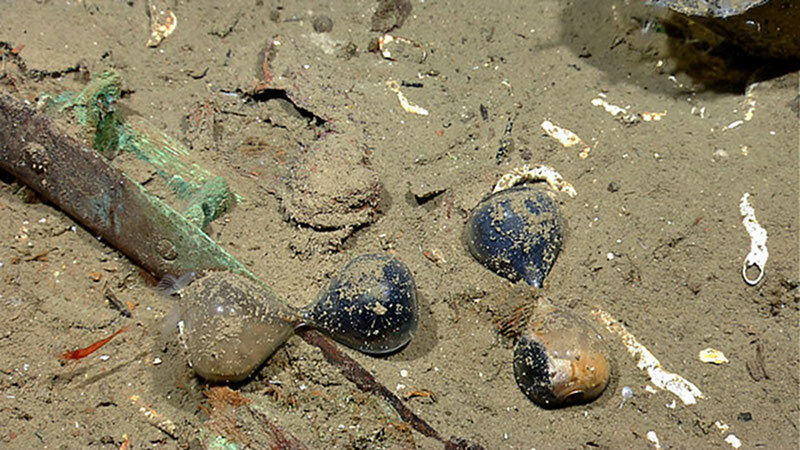 Scientists onboard the E/V Nautilus and ashore using telepresence technology will spend a week using the Hercules remotely operated vehicle (ROV) to carefully document, map, video, and photograph the site, and recover a small number of artifacts for conservation and analysis. NOAA's Seirios Camera Platform, operating above the Little Hercules ROV, images the ROV and an anchor inside the bow of the shipwreck. 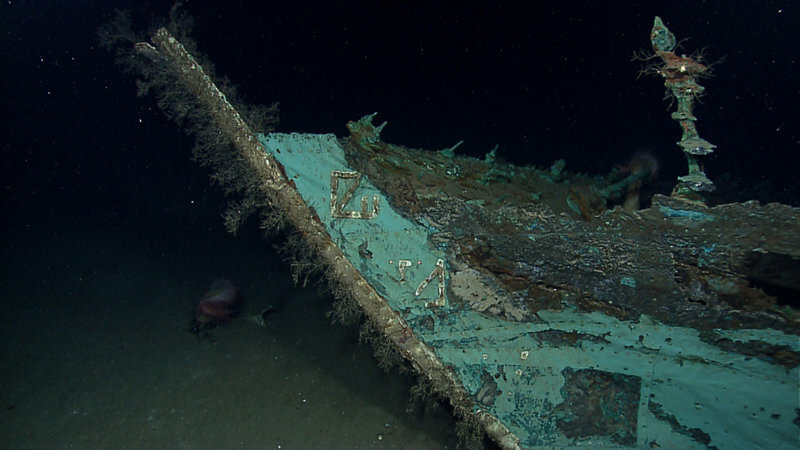 Copper sheathing outlines the shape of the bow as the wood has nearly all disintegrated after more than a century on the seafloor. Image courtesy of the NOAA Office of Ocean Exploration and Research. Download larger version (jpg, 2.1 MB). Information obtained during the expedition will help place the vessel in its historical and cultural context, to better answer questions about its age, origin, purpose, and possibly who may have been aboard when it tragically sank. Science partners include the Meadows Center, NOAA Office of Ocean Exploration and Research (OER), NOAA Office of National Marine Sanctuaries (ONMS), Bureau of Ocean Energy Management (BOEM), Bureau of Safety and Environmental Enforcement (BSEE), the Texas Historical Commission (THC), the University of Rhode Island , State of Maryland , Texas A&M’s Conservation Research Laboratory , Texas A&M Galveston , OET, and others. The expedition leaders and onboard participants are Frederick Hanselmann (Meadows Center), Jack Irion (BOEM), Frank Cantelas (NOAA), James Delgado (NOAA), Amy Borgens (THC), Michael Brennan (OET), Chris Horrell (BSEE) and Alicia Caporaso (BOEM). Other scientists will participate online and in real-time telepresence-enabled command centers ashore. The 2013 Monterrey Shipwreck Expedition was a truly collaborative effort and only possible by generous funding from the Way Family Philanthropic Foundation, Will and Pamela Harte, the Houston Endowment, and other individuals through the Meadows Center for Water and the Environment at Texas State University to foster and further collaborative archaeology and science in the Gulf. Live video from the seafloor and more information about the 2013 expedition can be found at Nautilus Live . 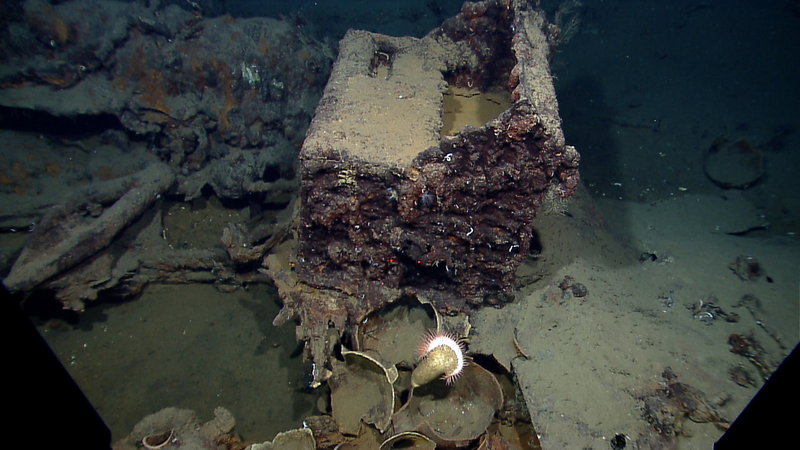 A cluster of large of artifacts near the center of the ship contains three artillery pieces, an anchor, and smaller objects. The large gun on top of the pile measures about 10 feet long and is a 12 or 18 pounder (meaning it shot a cannon ball weighing 12 or 18 pounds). 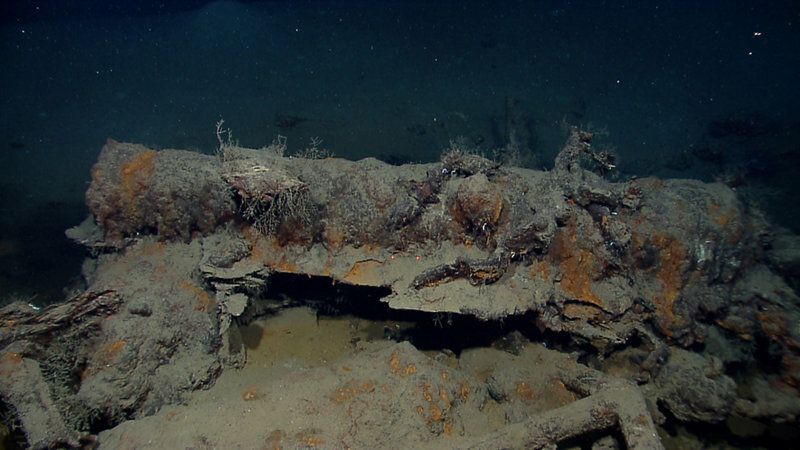 Fragments of the gun carriage embedded in the pile suggest this is a deck-mounted center-pivot long gun. Image courtesy the NOAA Office of Ocean Exploration and Research. Download larger version (jpg, 1.3 MB). In April 2012, NOAA Ship Okeanos Explorerconducted the first reconnaissance of shipwreck site 15577 in the Gulf of Mexico. First identified as a side scan sonar target in 2011, the brief remotely operated vehicle (ROV) dive made a truly exciting discovery that will contribute significantly to our understanding of a turbulent period of American history. The shipwreck appears to be an undisturbed, early 19th century, wooden-hulled sailing vessel. 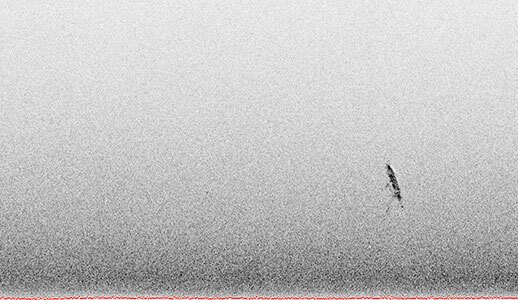 This is the first image of site 15577 when the shipwreck was discovered during a side-scan sonar survey of the Monterrey lease block in October 2011. The acoustic sonar image defined a tightly contained site with a sharp hull-formed outline measuring roughly 84 feet long and 26 feet wide. Image courtesy Shell Oil Company. Download larger version (jpg, 724 KB). The sonar target first came to light when Shell Oil Company notified the Bureau of Offshore Energy Management (BOEM) and the Bureau of Safety and Environmental Enforcement (BSEE), agencies of the U.S. Department of Interior, that a side scan sonar target resembling a shipwreck had been found in their lease area. The sonar image revealed a sharp hull-formed outline measuring approximately 25 meters (84 feet) long by 7.9 meters (26 feet) wide in 1,330 meters (4,363 feet) of water. The discovery came about because, as federal agencies, BOEM and BSEE oversee and issue permits for oil and gas exploration and development on the Gulf of Mexico Outer Continental Shelf. Under the National Historic Preservation Act of 1966, BOEM and BSEE are required to take steps that contribute to the preservation of sunken historic and archaeological properties. The oil and gas industry must follow specific BOEM guidelines for conducting surveys of the bottom using remote sensing instruments such as side-scan sonar and magnetometers before they are permitted to undertake activities that disturb the seafloor. As a result of intense oil and gas exploration in the northern Gulf, more than 600 shipwrecks and possible shipwrecks have been located, mostly through these surveys. 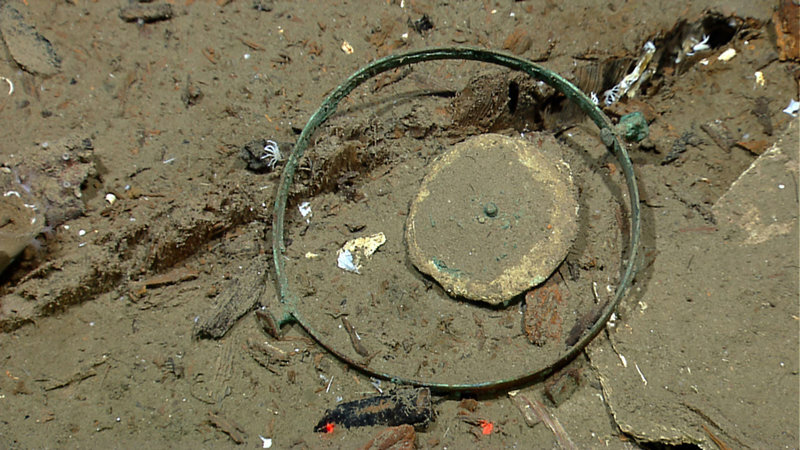 Several pieces of the ship’s compass were found in the aft part of the vessel. The compass card inside the gimbaled mount, shown here, is in an area where the ship’s binnacle would have been located. The two red dots at the bottom of the picture are laser lights that come from the ROV Little Hercules. ROVs often mount two parallel lasers to take measurements and these laser lights are 10 centimeters apart. Image courtesy the NOAA Office of Ocean Exploration and Research. Download larger version (jpg, 1.5 MB). 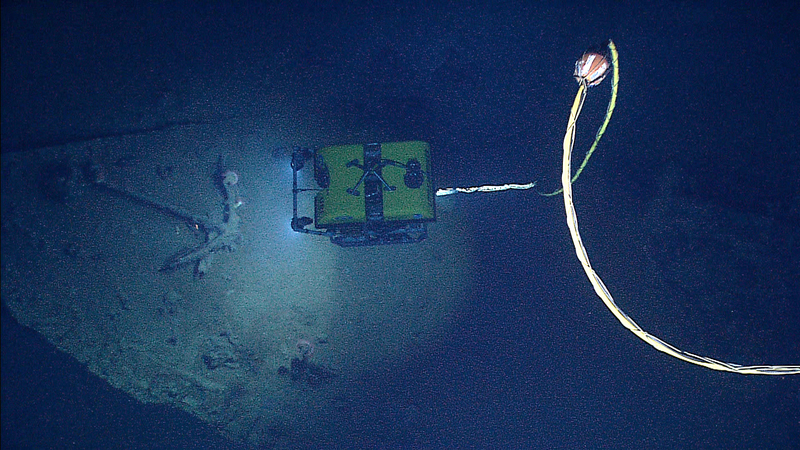 The Okeanos Explorer’s remotely operated vehicle dive on the shipwreck on April 26, 2012, lasted just over two hours, collecting valuable high-definition video. The remains of the relatively small vessel, about 84 feet long, are outlined by the copper sheathing fastened to the lower hull to protect the bottom from marine bio-fouling. While wood in close proximity to the copper sheathing has survived, the entire upper portion of the wooden ship has been consumed, allowing durable artifacts, such as those made from ceramic, glass, and metal, to drop to the bottom. The area of the Gulf where the site is located receives very little sedimentation, so many of the artifacts lay uncovered, mostly inside the hull. The ship’s iron stove rests on the edge of a lead sheet placed underneath to protect the wooden ship from catching on fire. It is rare to find a stove on a shipwreck in such good condition. 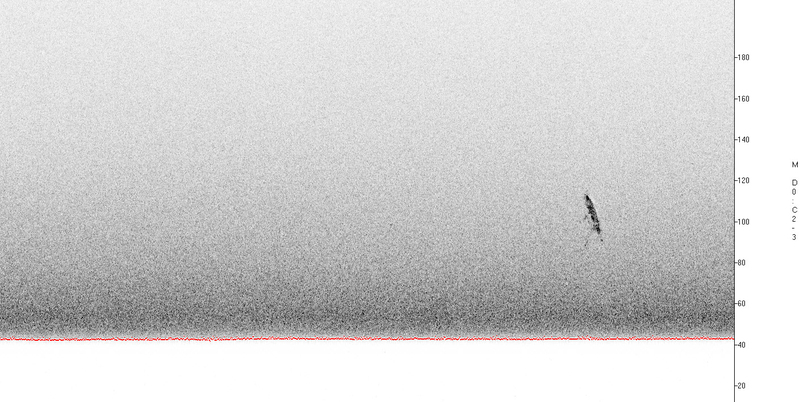 This one appears to be tipped over on its back. The broken ceramic jugs near the stove were most likely used for food or water storage. Their style is indicative of a type made in the Yucatan. Image courtesy of the NOAA Office of Ocean Exploration and Research. Download larger version (jpg, 1.2 MB). From the distribution of artifacts, we get a sense of how the vessel was organized. A large anchor in the bow was probably secured on the forward deck. Elements of the standing rigging along the length of the vessel indicate the location of the masts. A concretion of large metal objects located amidships contains an anchor, several cannon, and smaller artifacts. Some of these items may have been stowed below deck during the voyage. A large rectangular metal stove resting on a lead sheet (to protect the wooden deck from catching fire) and food storage containers, denote the galley area where food was prepared. Further aft, near the stern, where officers were quartered, are plates, bottles, glassware, firearms, medicine, and navigation instruments. The baseline data collected by Okeanos Explorer’s brief visit led to considerable follow-on research by a group of archaeologists and historians. The artifacts and vessel remains suggest the site dates to the first half of the nineteenth century, making it one of the more significant shipwrecks discovered in the Gulf of Mexico to date. The site, well preserved and remarkably undisturbed, is from a critical period in history when new nations were forming at the end of the Colonial Era and the Gulf was opening to global trade. While most of the wooden hull has long since disintegrated from the shipwreck, copper that sheathed the hull beneath the waterline as a protection against marine-boring organisms remains, leaving a copper shell that retains the form of the ship. The copper has turned green due to oxidation and chemical processes over more than a century on the seafloor. Oxidized copper sheathing and portions of the draft marks are visible on the bow of the ship. The grey strip covering the stem is lead. Image courtesy the NOAA Office of Ocean Exploration and Research. Download larger version (jpg, 1.3 MB). During the Okeanos Explorer Gulf of Mexico cruises, NOAA’s Office of Ocean Exploration and Research (OER) relied on the Bureau of Ocean Energy Management (BOEM) and private industry to identify potential shipwreck targets for exploration. Sand clocks, or sand glasses, were used as timers for the chip log line, which was trolled aft of the vessel and timed to determine the vessel’s speed for the navigator. In use, a line knotted at regular intervals is attached to the ship log. After deploying the log, a sailor counted the number of knots passing through his hand over a given length of time as measured by a sand clock. Vessels of the period carried sand clocks timed to various increments such as 28 and 48 seconds, as well as minute glasses. These are two of five sand clocks so far found on the shipwreck. Image courtesy of the NOAA Office of Ocean Exploration and Research. Download larger version (jpg, 1.6 MB). Partnerships have the obvious advantage of pooling knowledge and resources. OER and BOEM have worked as interagency partners since 2004 on a number of very successful, multi-year environmental studies in the Gulf of Mexico and the Atlantic which serve each agency’s missions. These are systematic studies to locate and characterize deep-water shipwrecks and habitats such as corals and seep-associated marine communities. The primary objective has been to provide information on cultural resources, biodiversity, and ecology to enable informed decisions of future oil and gas development activities. Okeanos Explorer cruises provide a new avenue to continue this work and strengthen and expand the partnership as well as providing an all-too-rare opportunity to study shipwrecks using the most advanced deep-water systems available. As happened with Site 15577, extraordinary discoveries often inspire new research and new partnerships, increasing our knowledge of the ocean and, in this case, our shared heritage.